Malcolm Turnbull has promised not to talk down to the Australian electorate. Michael Brull wonders why, then, he won’t permit a debate in parliament on the war in Syria. When Malcolm Turnbull announced he was going to challenge Tony Abbott’s leadership of Australia, he said that he was going to bring in a new style of leadership. Whilst Abbott was best known for his election slogans about boats and tax, he also pushed the new war on Iraq with little more than innuendo and cheap sloganeering. This is also how he pushed the new war on Syria. If Turnbull is serious about respecting the intelligence of Australians, why doesn’t he start by seriously debating the war on Syria? An easy place to start is in the Senate, which is a place one would think is expected to discuss those sorts of issues. The Daily Telegraph reported an “intelligence source said the Prime Minister had told defence chiefs that if and when the decision was made, he wanted at least one air strike by the end of this week.” It took about two hours for Bill Shorten, so-called Leader of the Opposition, to endorse the new war. The Guardian reported that there was some concern about the new war from ALP MPs Melissa Parke, Doug Cameron, Alannah MacTiernan, Jill Hall, Andrew Giles, Pat Conroy, and Sue Lines. Their concerns weren’t expressed in any public statement, and there has been basically no debate in either the Parliament or the Senate on the new war. Turnbull derided the Abbott government for relying on slogans instead of advocacy. One would think that war is above all an issue that requires cool and calm reflection, and serious analysis. The decision to go to war should never be taken lightly, and a government which is concerned about the loss of life war brings would welcome critical scrutiny to the greatest extent possible, to ensure that our policies are wise, humane, and don’t needlessly risk human lives. So what happened in our Parliaments? In the lower house on September 9, Bill Shorten suggested that they discuss a “matter of public importance”: “The humanitarian crisis in Syria”. Given that he has already endorsed the war, this is presumably a figleaf to malcontents within the party, rather than a serious reservation. This is simply sloganeering. What kind of political solution does Bishop want? The defeat of Assad? The defeat of the Islamist rebels? A compromise? Nothing of the sort has been suggested, beyond our desire for defeating our enemy. This simply makes resolution of the conflict more difficult, as the war is being taken further out of the hands of the Syrians themselves, and increasingly driven by the interests of foreign powers which have shown little concern for the Syrians who are actually paying the price of the war. Last week, there was an important report that Russia offered a peace deal in February 2012 which would include Assad stepping aside. The message was passed on to the American, British and French missions at the United Nations, which promptly ignored the offer. The result has been the complete devastation of the country. It was already clear by August 2012 that the West’s favoured rebels were fanatical jihadis. Indeed, US intelligence predicted the emergence of a “Salafist principality in Eastern Syria”. If there is any evidence that more Western meddling will make the situation less catastrophic, it has not yet been produced. By August 15, this had been toned done to “many serious questions that remain unanswered”. On 21 August, we did need a “strong military response” to Daesh, and by 28 August we had a “humanitarian obligation” to help them. Does anyone seriously think people in Syria have been anxiously waiting for Australia to bomb their country? As expected, on September 9 Plibersek endorsed the new war. Plibersek said we must provide “safe havens” for Syrian refugees, apparently without opening our doors wider to Syrian refugees, or treating more humanely Syrian refugees in immigration detention. Presumably she simply means we should create more safe areas in Syria through bombs. Plibersek too favours a “political solution”, which quite literally everyone in every conflict is in favour of. The question is what kind of political solution? Plibersek, like the others in the parliamentary debate, didn’t go beyond cheap slogans. Whilst in the lower house, the “debate” was just exchanges about how glorious our new mission is, in the Senate, the Greens had already signalled their opposition to the war. Fearing that the new policy would be subjected to critical scrutiny, the two major parties did their best to block such debate. It’s no big deal, why should anyone get “overexcited” over Australia bombing Syria? Senator Abetz then adopted the path of his then leader, with cheap slogans about how Daesh has done lots of terrible things, and “Yet there is not a word of support for our service men and women, or the service men and women of other countries that are doing exactly the same. We on this side salute the service of our men and women who are putting themselves on the line to protect us” and so on. Di Natale claimed that there was a genocide going on in Syria, but that Daesh wasn’t the primary source of it. This appears to be Di Natale’s favoured argument against the war – that Assad is even worse than Daesh. In an interview with Andrew Bolt, he said that Assad, not Daesh, is the “main game” in Syria. The debate then moved to Senator Abetz’s continued sleazy baiting of the Greens, by claiming that they don’t support “our service men and women”, unlike “We on this side”. Di Natale responded that this was “the refuge of a scoundrel. To suggest that what we are doing by questioning our involvement in a war in Syria is somehow reflecting a lack of commitment to the troops engaged in conflict in that region is pathetic”. Liberal Senator Ian McDonald then raised a point of order. McDonald has earned attention recently for suggesting in the Senate that Doug Cameron should “speak Australian”. He also admitted to not having read the Gillian Triggs report on children in detention that he so harshly condemned. McDonald also distinguished himself by referring to GetUp as the Hitler Youth wing of the Greens. Senator McDonald expressed mystification on Di Natale’s motion. He explained, “My point of order is that he is not explaining why it is essential to suspend standing orders.” Why couldn’t it be dealt with “in some other way”? Senator Di Natale responded obviously enough: “I do not know what could be more important than the lives of Australian service men and women. What could be more important than that? Why are we not having a debate in this parliament about whether we should be committing our troops to another conflict overseas”? The government opposes the motion; no case has been put in relation to urgency. The last thing our service men and women need is the strategic thinking and input of the Australian Greens as to how we might conduct military activities overseas. I think what they actually want is the advice of the intelligence services and the men and women who are at the apex of the Defence organisation. The Leader of the Australian Greens, as is their wont, hypocritically asserted that I engage in the activity of ‘the refuge of the scoundrel’ and he accused the Australian Prime Minister of sending young Australian service men and women into a theatre for only one purpose — that is, his own political benefit. That is a disgraceful suggestion. It is beneath contempt. And yet, while they say it is outrageous to say anything against their motives, they drop it by the bucket load on the Prime Minister and say that is all fair. It is hard to overstate the sheer cynicism of this attack on the Greens. Yet this represented most of the actual debate on the war we have seen thus far in the Senate – and indeed, in either house on the war on Syria. “The Opposition will not be supporting this motion. We do accept the general view that has been put that there should be a parliamentary discussion on this. In fact, we made this point very strongly to the government today. So no actual debate on the war is needed, but it would be nice if the federal government told Senators how the war was going. Why actually subject the war to any critical scrutiny? Why let the Greens argue about it? Conroy even added, “I urge the government to clear some time in the parliamentary schedule, by negotiation or from its own time, to enable all of the senators in this chamber to discuss and debate this issue”. He made that claim whilst voting against the Senate actually debating the war. Because the ALP thinks we’re stupid too. And it would be inappropriate to debate the war on Syria the day Abbott decided that Australia would bomb Syria. The Greens should plainly just be content with debating the war when the Coalition feels like discussing it, whenever that might be. Then came the vote on whether the Senate would debate the war. 37 noes, 10 ayes. The ayes were the Greens and Senator Jacqui Lambie. The Greens have continued to try to debate the war in the Senate, to little avail. 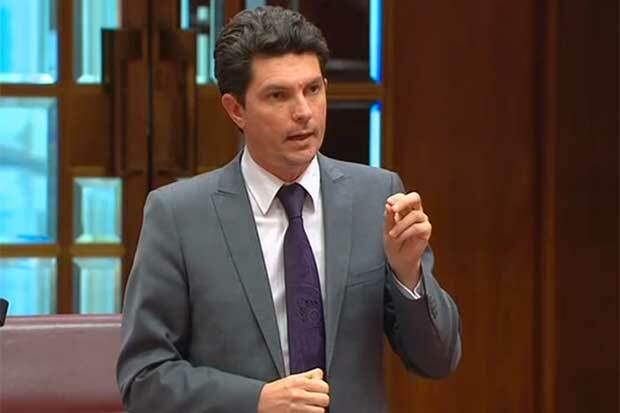 You can watch this video of Senator Ludlam, from September 17, frantically objecting to the war in the one minute and seven seconds he was given to speak. At that point he was cut off. So, Mr Turnbull, how about it? Why not let the Senate debate the war? If you believe in “advocacy, not slogans”, why don’t you start by allowing a serious debate on the war on Syria? Originally published at New Matilda.